The thing about making sweets which makes me think I’ll never tire of making them, well, of course, besides the delicious taste, is the absolute wonderful variety in decorating ideas…. endless! Sweet art really. 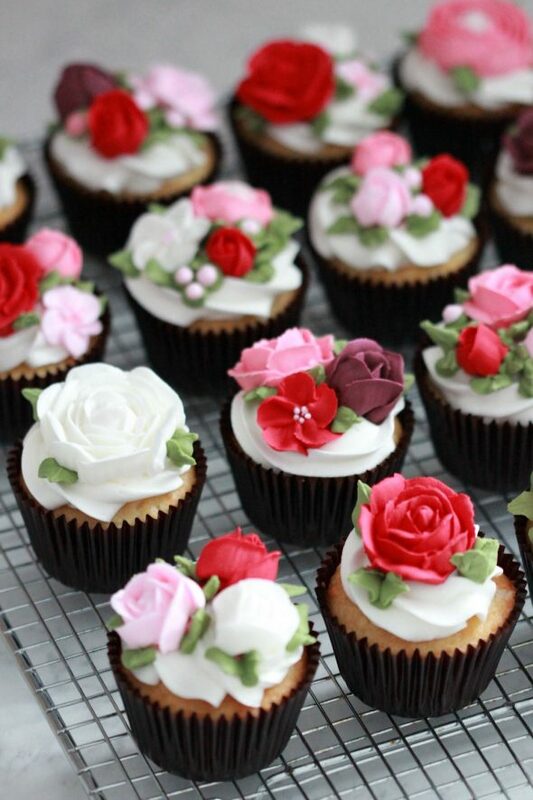 And lately what’s been captivating me are those gorgeous buttercream flower cakes. Have you seen them? One of my favorite examples is ivenoven from Jakarta. I follow her on Instagram and have based these cupcake here off of her designs (Thank you!). I really do need to practice making the flowers, but it was fun seeing the different results of playing around with different piping tips and angles. I’m definitely not ready to share a tutorial, but I’ll share more on the tools I used to make these below. 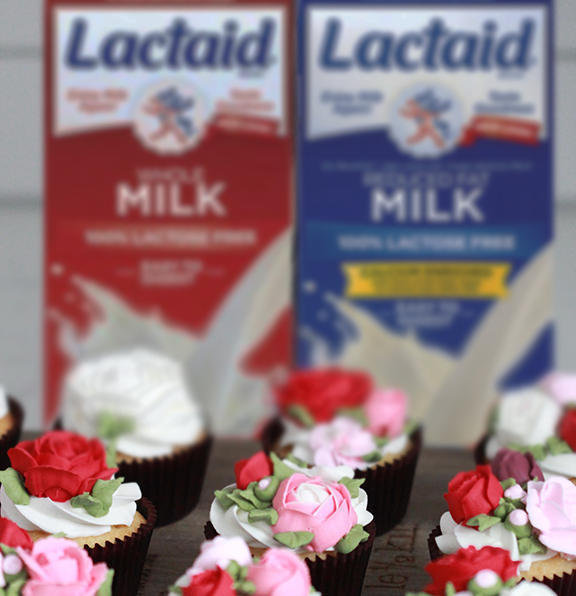 I used 2% Lactaid milk in my classic white cake cupcakes and 3.25% whole milk for the frosting. Both tasted delicious and had excellent results, tasting like any other milk brand with lactose. You can find the cupcake recipe below and the frosting recipe here. * I used the 3.25% milk in the frosting recipe. * I adapted the basic white cake recipe from Robin Hood Recipes: Cakes & Icings . 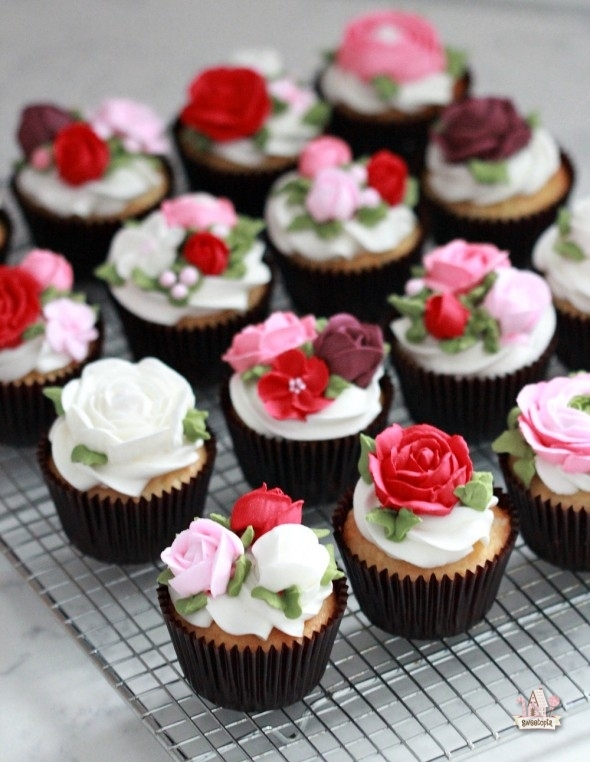 * I used the following piping tips for the flowers; #101 , #102 , #104 , #81 and for the leaves; piping tip #402 . 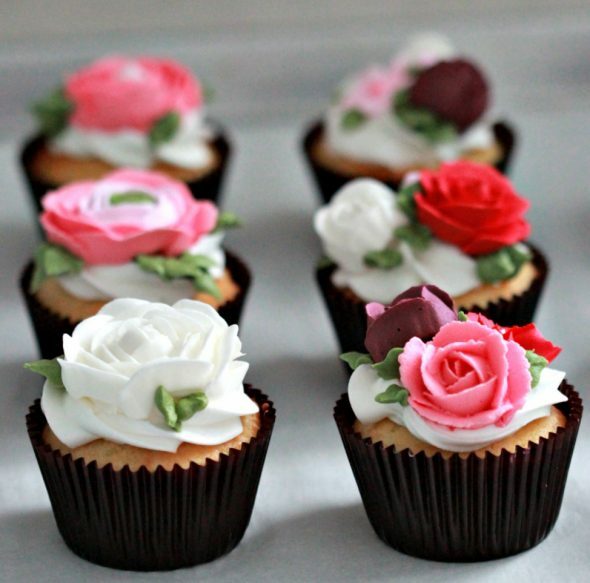 * This photo which I found on Pinterest was my starting point inspiration for which piping tips to use. Have fun baking and decorating and an early Happy Valentine’s Day to you! Preaheat oven to 350 degrees Fahrenheit and line your muffin tin with cupcake liners. Sift flour, baking powder and salt onto parchment paper. Stir thoroughly to blend. Cream shortening until fluffy; gradually add sugar mixing until creamy. Add vanilla and then eggs, one at a time, beating well after each addition. Add dry ingredients alternately with LACTAID® milk, starting and ending with dry ingredients and mixing until well blended after each addition. Use a 1/4 inch cup or ice cream scoop to add cupcake batter to liners. Bake for approximately 15 minutes or until an inserted toothpick comes out clean. Let cupcakes cool and ice with frosting. Really nice things! I don’t know how you can say you lack experience they are so cute! Congratulations! 😀 I tried to reach you before, early January, regarding an editorial project I’m developing. It would be great to hear from you! Hi Marian. 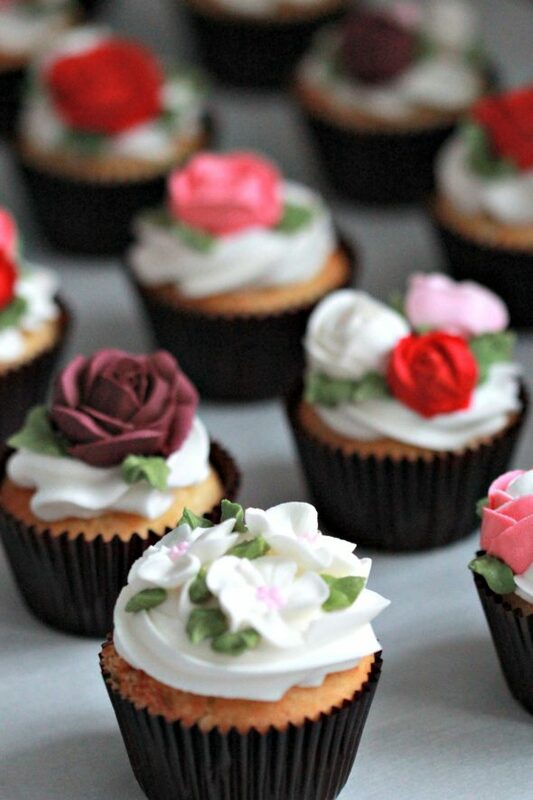 Beautiful cupcakes! I noticed on your ingredients list that there are no eggs listed but on the instructions it tells us when to add them. I’m sure it’s an oversight on the ingredients list. Will you please tell us how many eggs to add? Thanks for noticing! I forgot to add the eggs in the ingredient list and will go do that now! Happy baking! 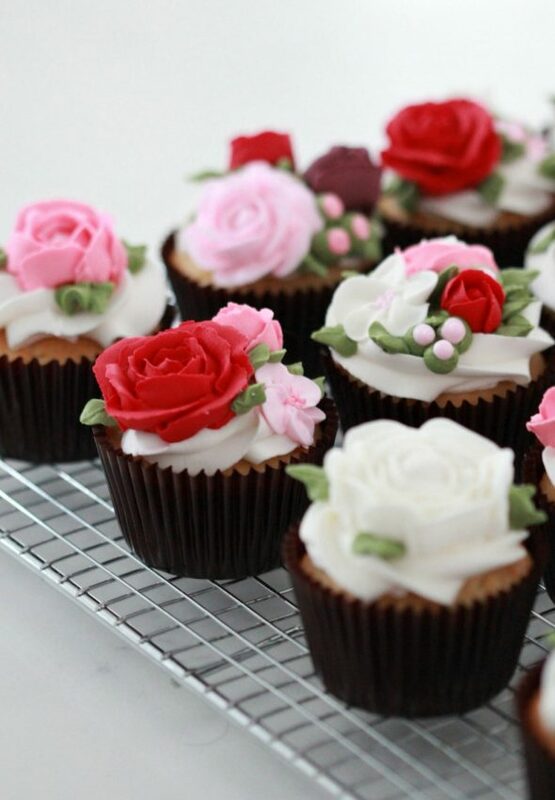 Very beautiful cupcakes! Love you your talent’s Thank you for sharing this special recipe. What a giant ad for an advertiser. You’ve completely sold out, Marion. Your words are worthless, a giant ad in themselves. At least explicitly label this as an advertorial for the benefit of readers. I’m sorry to hear that. 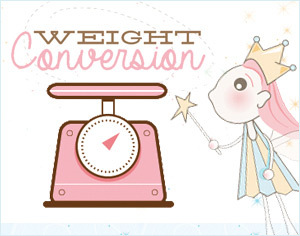 I love sharing on my blog and only share products that I think are worth sharing. I hope this helps people who are lactose intolerant and don’t know about this option. I have shared in the post that it is sponsored as well. There are other sponsorship offers I reject. I put a lot of time and effort into every blog post and am sad to hear that you don’t find either the recipe or the flowers blog-worthy. Isn’t (sincere) blogging just like any other job: huge amount of work? It certainly is (and you can tell just by looking at certain blogs, who puts in a lot of effort, and who doesn’t) and when you DO finally get a chance to get paid for it you can call yourself lucky because finally it pays off all the hundreds of hours you spent on your blog, giving away information to thousands of readers FOR FREE. There is always two sides, you know. Just picture all of Marian’s blogposts/recipes in a book: Is that a sell-out to you as well? If she made money off a book? It is the same thing though – there is no difference. I can understand bloggers who accept money for posts. Of course: You want to stand behind the product, that goes without saying. Look at her quality of blogposts, the beautiful photos and stunning treats she creates with all the helpful information, giving advice to readers when they ask questions in comments. Anyone putting so much effort in posts deserves to get paid for that. These are fantastic! Your piping skills are through the roof!!! Thanks for sharing. I am constantly inspired by you! Can I swap out the lactaid for whole milk? Absolutely, yes. Have fun baking! Hi there! I am a recent follower of your blog and I find it to be enormously helpful, easy to follow and read and your talent amazing! 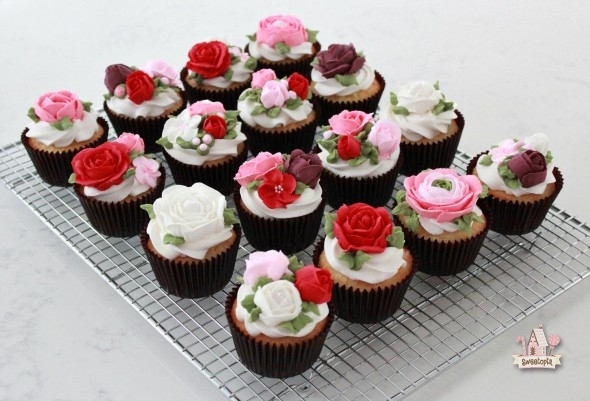 When your ready to do a tutorial on these beautiful white cupcakes and roses I will be the first to try them out! Thanks for sharing and making the world a sweeter place! You are beyond talented and generous to share your beautiful and amazing work. I would never have guessed a milk carton would unhinge someone. Hate and jealously I guess. Keep up the good work and know you gave true fans who love you and would never judge you. Please ignore that sad, trifling person. Marion, I enjoyed this post. I appreciate testimonials on products I’ve never tried before. Buttercream is where it all began for me, until I found you and got the courage to try Royal Icing. I appreciate your effort and will always check in to see what I can learn from you. Keep up the great inspiration. I have a question about glaze. This is something I’ve had problems with since I started baking and I finally decided, “You know what? It’s time to ask a pro.” Powdered/confectioner’s/icing sugar. It’s in every glaze recipe I’ve tried. Most recipes I find are very simple. Confectioner’s sugar, milk, maybe some vanilla. But no matter what, the strange bitter/sweet/fake taste of the sugar is impossible to mask. I’ve ruined delicious donuts by glazing such a sweet dessert with the nasty taste of glaze. Today, I was making homemade poptarts and made a glaze with confectioner’s sugar and milk. It had that strange confectioner’s sugar taste. So I added vanilla. Still the same taste. So I added heaping tablespoons of strawberry jam. None of it helped. That particular taste is so powerful. I can’t describe it. It’s like a bitter/cardboard taste that’s slightly sweet. I really hope you know what I’m talking about because I have Googled this numerous times and I can never find ANYONE that seems to have this issue, lol. I feel like I’m crazy. I mean, someone out there has to know that gross taste homemade glaze has. When I think of glaze, I think of a sweet, glossy coating. Okay, so here’s my question. How do I mask this taste? Or can you make a glaze without confectioner’s sugar? And most importantly, do you have a glaze recipe that I can use that doesn’t have this strange taste? It has to be possible, lol. There are mom and pop bakeries out there in the world and they use glaze on their cookies and donuts and cakes and they don’t use preservatives and all these weird ingredients processed goods have–or do they? Please help me. I would so very much appreciate it! I’ll try and respond but our experiences will be different due to our unique taste buds, and I can already say that I haven’t experienced icing sugar the same way you have, however, perhaps a strong flavouring such as lemon juice might help. As far as I know, white glaze usually uses icing sugar. Chocolate glaze is an option, but I’m guessing you’re looking for the white glaze look. If I do come across an alternative, I will definitely share on my blog! Love the work you do and these cupcakes look amazing. I have a short and quick question though. I live in Norway, and are not familiar with LACTAID. What is it? These cupcakes are gorgeous! The roses are stunning, love the colours too!